Definition at line 499 of file xmlstorage.d. Definition at line 506 of file xmlstorage.d. 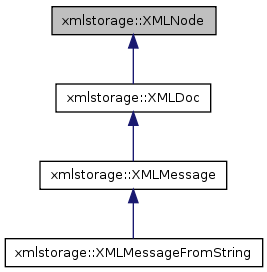 Reimplemented in xmlstorage::XMLDoc, and xmlstorage::XMLMessage. Definition at line 521 of file xmlstorage.d. Definition at line 528 of file xmlstorage.d. Definition at line 535 of file xmlstorage.d. Definition at line 587 of file xmlstorage.d. Definition at line 572 of file xmlstorage.d. References _attributes, _children, _content, _end_leading, _leading, _trailing, and assign(). Definition at line 559 of file xmlstorage.d. Definition at line 777 of file xmlstorage.d. Definition at line 747 of file xmlstorage.d. Definition at line 737 of file xmlstorage.d. Referenced by get_child_relative(), xmlstorage::XMLPos::go_down(), and xmlstorage::XMLPos::smart_create(). Definition at line 758 of file xmlstorage.d. Definition at line 611 of file xmlstorage.d. Referenced by xmlstorage::XMLPos::get(), put_subvalue(), and subvalue(). Definition at line 676 of file xmlstorage.d. Definition at line 928 of file xmlstorage.d. Referenced by create_relative(), and find_relative(). Definition at line 671 of file xmlstorage.d. Definition at line 681 of file xmlstorage.d. Definition at line 729 of file xmlstorage.d. Definition at line 622 of file xmlstorage.d. Definition at line 599 of file xmlstorage.d. Definition at line 605 of file xmlstorage.d. Definition at line 814 of file xmlstorage.d. Definition at line 837 of file xmlstorage.d. References xmlstorage::XMLFormat::_endl, xmlstorage::EncodeXMLString(), and xmlstorage::XML_INDENT_SPACE. Definition at line 593 of file xmlstorage.d. Definition at line 659 of file xmlstorage.d. Definition at line 686 of file xmlstorage.d. Definition at line 869 of file xmlstorage.d. Definition at line 635 of file xmlstorage.d. Definition at line 646 of file xmlstorage.d. Definition at line 691 of file xmlstorage.d. Definition at line 725 of file xmlstorage.d. Definition at line 696 of file xmlstorage.d. Definition at line 793 of file xmlstorage.d. Definition at line 718 of file xmlstorage.d. 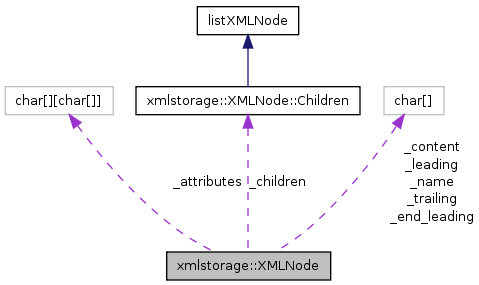 Referenced by assign(), and xmlstorage::XMLReaderBase::StartElementHandler(). Definition at line 717 of file xmlstorage.d. Definition at line 721 of file xmlstorage.d. Definition at line 722 of file xmlstorage.d. Definition at line 720 of file xmlstorage.d. Definition at line 503 of file xmlstorage.d. Definition at line 723 of file xmlstorage.d.